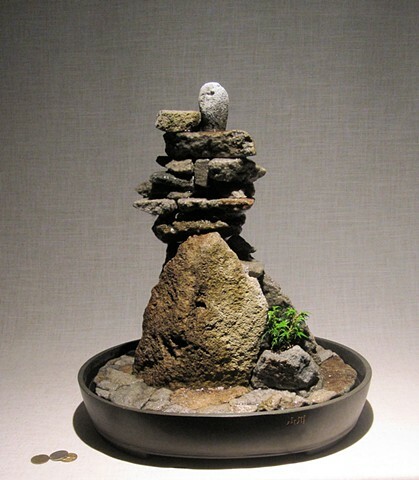 All the pieces for this composition came from a single large rock. The dwarf ivy near the base recalls the tiny plants and lichens that emerge in the microclimates surrounding arctic stones as the weather warms. The Korean tray, a casting of 85% mica and graphite, is hand burnished but otherwise unfinished. (1) Hessel, I. (1993). Canadian Inuit Sculpture. Ottowa: Indian and Northern Affairs Canada. (2) Hallendy, N. (2000). Inuksuit: Silent Messengers of the Arctic. Vancouver: Douglas and McIntyre, Ltd.